Between his impressive NHL career and his time in politics, Ken Dryden is a name most people in Canada recognize. Now the Hall of Fame goaltender is coming to Fredericton as the guest speaker of the second annual Peter Gzowski Invitational Literacy Dinner presented by KPMG, taking place on Monday, April 13, at the Delta. Dryden is interesting because there are so many sides to him. In addition to his renowned NHL career in which he won six Stanley Cups in eight playing seasons with the Montreal Canadiens, he was also president of the Toronto Maple Leafs from 1997 to 2003. He was a Liberal member of Parliament from 2004 until 2011 and was a cabinet minister from 2004 until 2006. He’s also the author of several books. Though most people know of The Game, the book that makes him such a great fit for this event is In Schools: Our Kids, Our Teachers, Our Classrooms. Though he’s the main speaker at the event, Premier Brian Gallant and Shelagh Rogers, host of CBC’s The Next Chapter and chancellor of the University of Victoria, will also be taking part. Also worth noting, Marshall Buttons is returning as the event’s emcee, says Natasha Bozek, executive director of the Literacy Coalition of New Brunswick. The reason behind the event is a desire to improve literacy in the province. “What it really is, is to be able to raise funds to support adult literacy programs, family literacy programs, schools and libraries, community groups all across the province, in order to ultimately improve literacy scores in the province,” she says. There are no easy answers as to why this is the case. “On the adult literacy side of things, what has been difficult is we’ve been so natural resource-based and a lot of people didn’t need to finish school to be able to do those jobs, to get paid well and take care of their families. We still have that group of individuals that are part of the statistics,” says Bozek. That is only part of the issue, however. “Right now on the adult side of things we’re hovering around 50 per cent. A little over 50 per cent of the population are not functionally literate. “So they’re not illiterate, but they’re not functionally literate in the sense that they can do some things, like maybe read a menu or read a sign, but they struggle to be able to do daily literacy related things,” she explains. She says these are all lumped together in essential skills, as they are things we need to use on a daily basis. “That’s what we’re trying to focus on. Essential skills is the new buzz word. Literacy has had so much negative connotation for so long, so we have talked more about essential skills – reading, writing, numeracy, how to read and use documents, how to use computers, being able to work in a group with other people productively, team-working skills,” says Bozek. The PGI Literacy Dinner is a great way for people to support positive change in this area, while enjoying a great evening with Dryden, as well as having the change to take home some great items from the silent and live auctions. He says that they’ve got a couple of other major items planned for the live auction, but the organizers are keeping them under wraps for the moment. The Second Annual Peter Gzowski Invitational Literacy Dinner presented by KPMG in support of the Literacy Coalition of New Brunswick is taking place on Monday, April 13, at the Delta Fredericton. The reception begins at 6 p.m. and will feature entertainment by two members of the New Brunswick Youth Orchestra, Sienna Cho and Chris Murray. The dinner will begin at 6:45 p.m.
Tickets to the event are $150 each and a table of eight is $1,200. Tickets are available online at nb.literacy.ca/pgi or by calling 457-1227. NHL Hall of Fame goaltender and author Ken Dryden will be the guest speaker at the Second Annual Peter Gzowski Literacy Dinner, taking place Monday, April 13, at the Delta Fredericton. 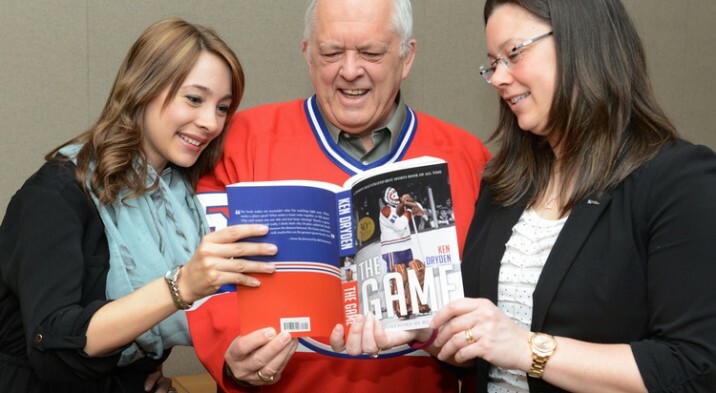 PGI chair Bob Scott, shares a look at Dryden’s book The Game with Katelyn Kelly, left, PGI cabinet chair, and Natasha Bozek, executive director of the Literacy Coalition of New Brunswick. All proceeds from the dinner will go to fund LCNB projects.